I’ve been sitting on this blog post for a little while to let the Gluten free Red Velvet Beetroot Cake go down. But the wait is over and it’s time to write this blog to get everyone hungry again! This bake, was inspired by a conversation I’d had with photographer and long-time NBBO admirer Celia. Celia has been gluten free for about 5 years and has been tormented with delicious looking cakes on here that she couldn’t possibly eat. One day we were talking about cakes (as you do) and I mentioned that I wanted to do a cake with rhubarb, something Celia grows. I offered to make the cake gluten free and said she could have some if she provided the rhubarb. Seemed like a win-win for both parties so she agreed and I baked it on thursday. 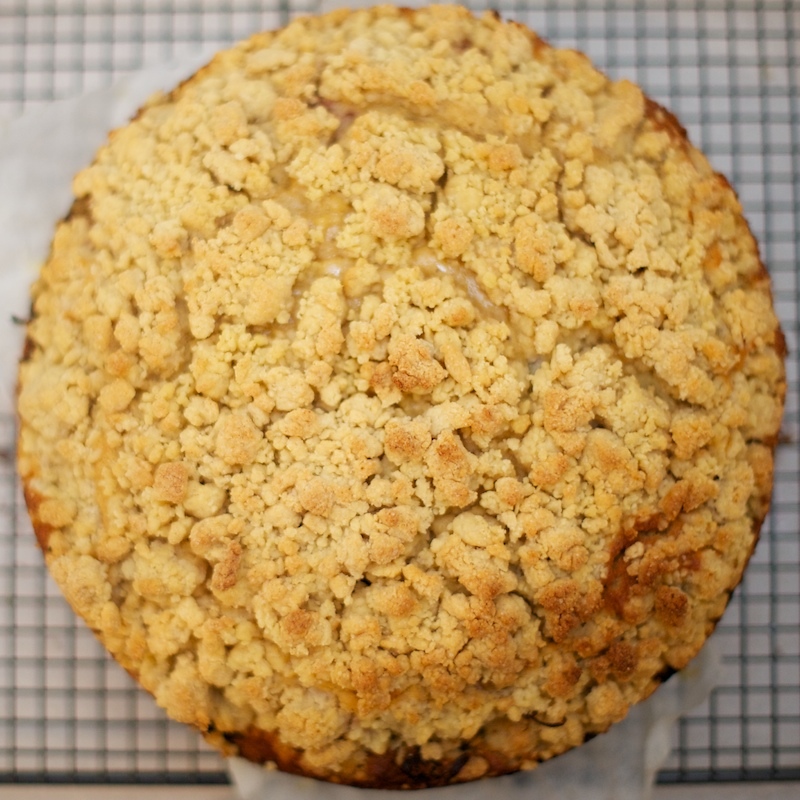 I adapted a recipe found on BBC Good Food and used the crumb topping from my Banana & Coconut Crumb Cake. Heat oven to 200C/fan 180C/gas 6. Rinse 400g rhubarb and shake off excess water. Trim the ends, then cut into little-finger-size pieces. 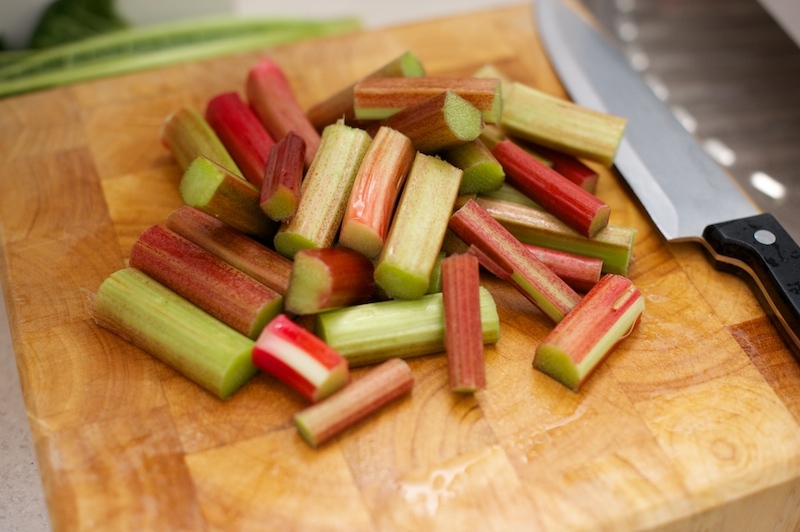 Put in a shallow dish or a baking tray, tip over 50g caster sugar, toss together, then shuffle rhubarb so it’s in a single layer. Cover with foil, then roast for 15 mins. Remove foil. Give everything a little shake, roast for 5 mins more or until tender and the juices are syrupy. Drain the juices into a cup and keep for later. Now the Rhubarb is done, start on the sponge. Butter and line a 23cm loose-bottomed or springform cake tin. Spoon one-third of the mix into the tin, add some of the rhubarb, then dot with one-third more cake mix and spread it out as well as you can. 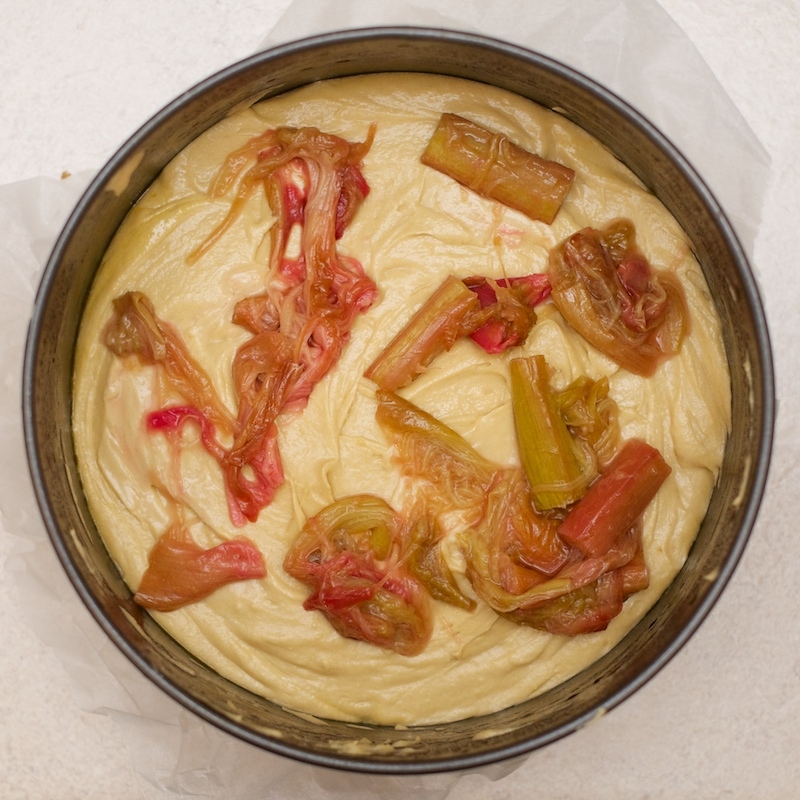 Top with some more rhubarb, then spoon over the remaining cake mix, leaving it in rough mounds and dips rather than being too neat about it. Scatter the rest of the rhubarb over the batter, then dot the remaining custard over. 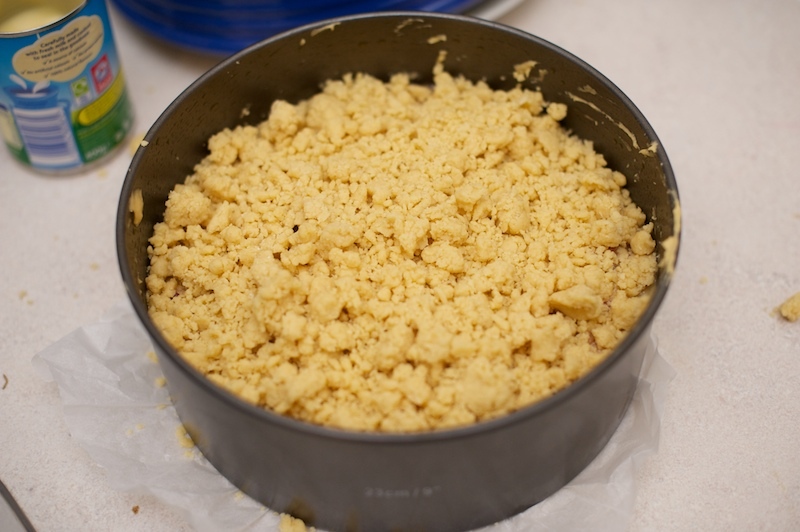 Now make the crumble top. 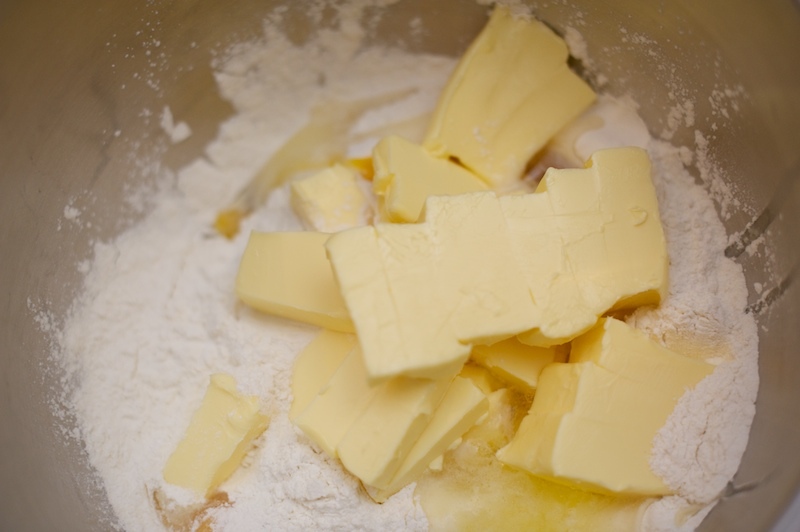 Stir together the flour, sugar, baking powder, cinnamon and salt, then mix with the butter. 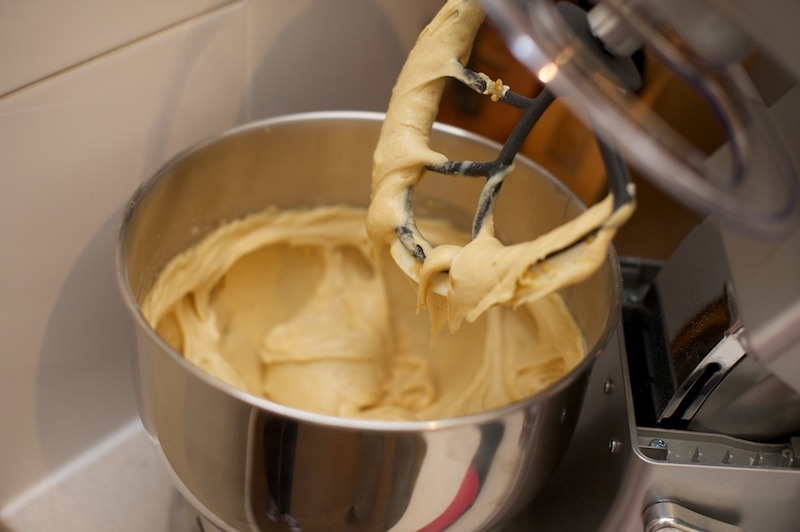 Leave the mix to stand for a few minutes and then use your fingers to break it in to crumbs. 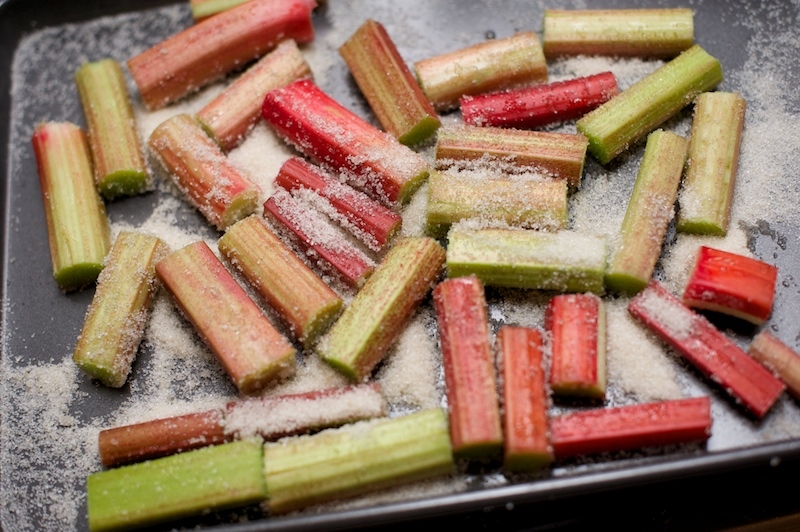 When you have crumbs, sprinkle them over the rhubarb. 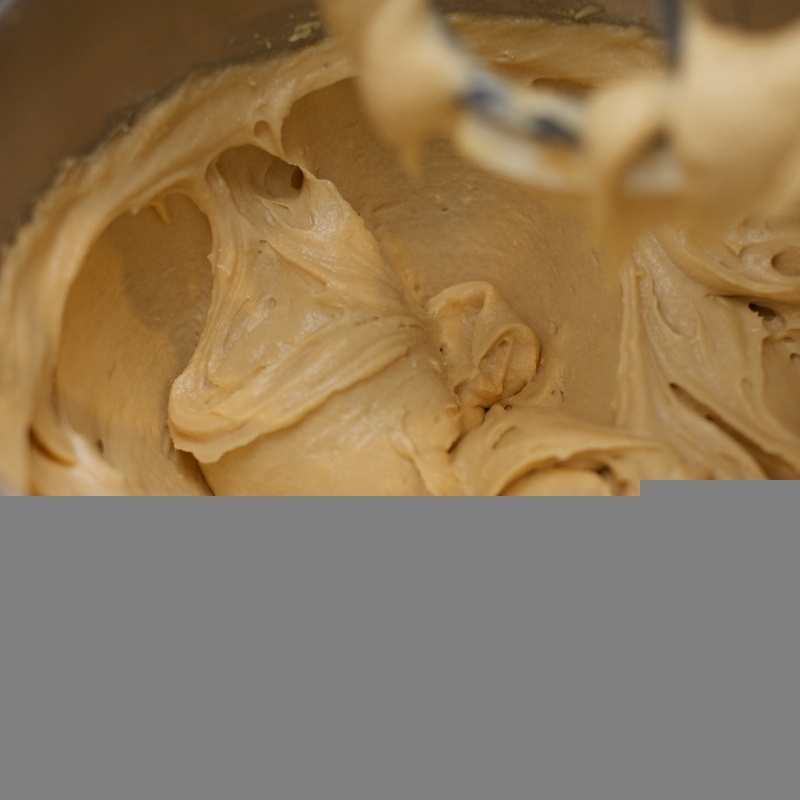 Bake for 40 mins until risen and golden, then cover with foil and bake for 15-20 mins more. It’s ready when a skewer inserted into the middle comes out clean. Cool in the tin, it helps the cake to set. Once cool, pop the cake out of the tin and admire it! It was getting late and Celia had to get a couple of slices for the road while it was still warm. The day after I poured the rhubarb juices over the top of the crumble and ate it with more custard. It was wonderful! 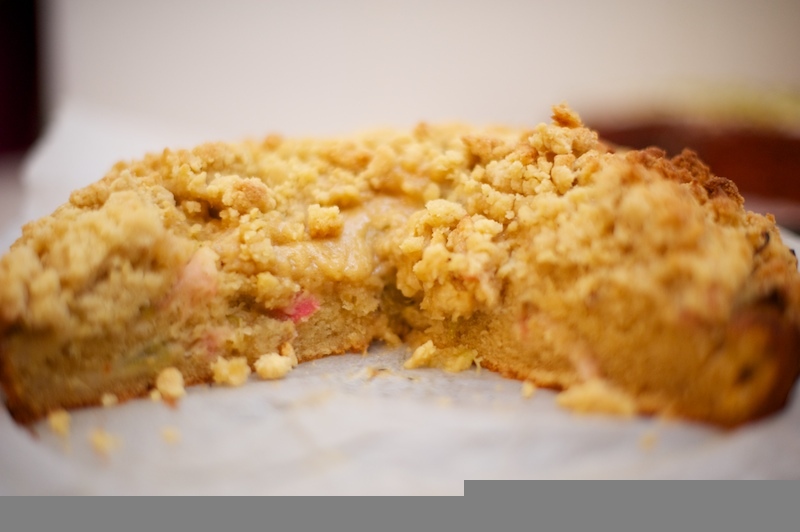 Next time I bake this, and there will be a next time, I’ll use double the rhubarb and less crumble as the flavour was a bit too subtle for me! Thank you so much for the rhubarb Celia, I hope you enjoyed it as much as I did. Yep more rhubarb please 🙂 When we got a rhubarb hit, the texture of the cake just set it off wonderfully and I tell you what, with a generous pouring of cream it made an absolutely delicious desert cake, which both me and himself really enjoyed. I will up your mark…purely because I didn’t have to cook it 7.5/10 Hope that is OK! I preferred making smaller muffin sized ones as the large cake took ages to bake and sadly ended up sinking in the middle…it has been great heated up with a big dollop of custard though. This gluten-free one sounds lovely! This will be next on my list with our next batch of rhubarb. 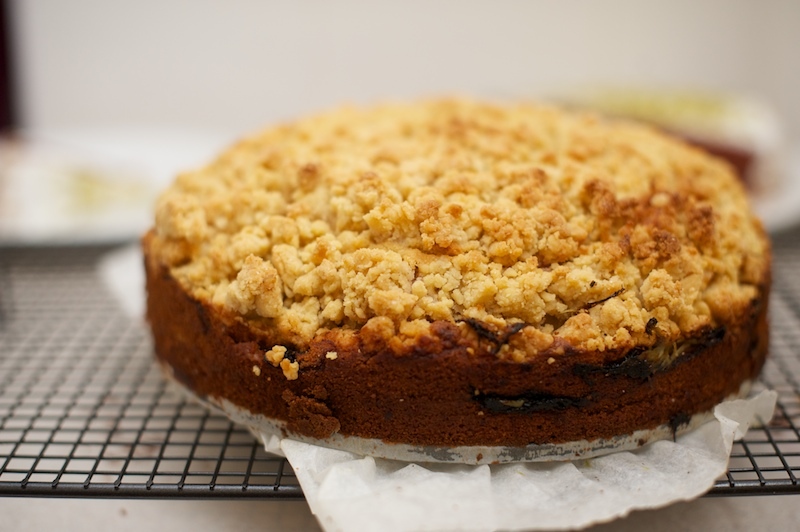 Crumble-style cakes do not last long in our household! This is a great recipe and a perfect way to use up the rhubarb in the garden. 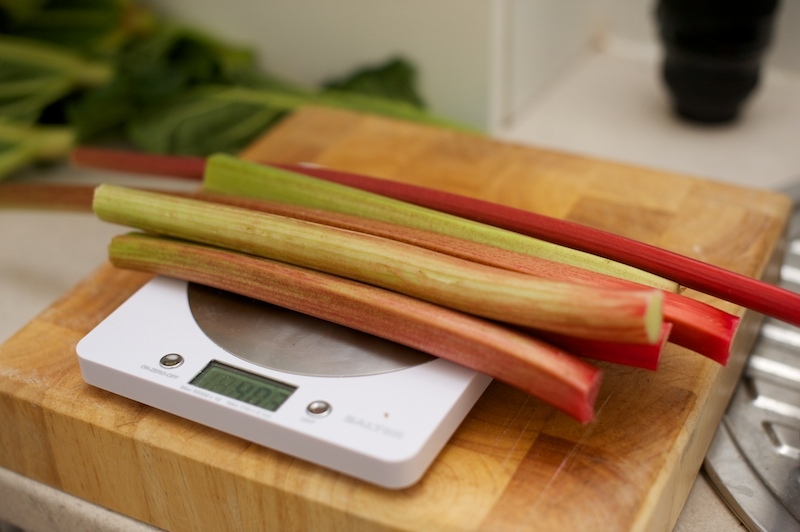 I have made it a few times now – a few suggestions: add more rhubarb (600g), cut down on the crumble topping which makes it rise more and the custard is essential (I left it out of on version and it was not the same).